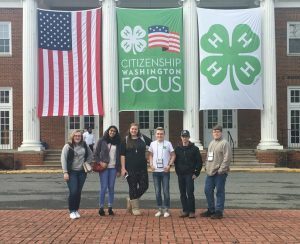 We Need Your Help VA 4-H! A brand new 4-H promotional campaign will begin March 1st called Raise Your Hand & Pay It Forward. The intent of this promotion is for alumni acquisition. However, it is also a competition between states to see who can get the most 4-H Alumni to “Raise Their Hand” between March 1st and June 30th. The state with the most registered alumni will win $20,000 for their state 4-H program! The site will be live on March 1st. If you are a 4-H Alum and have not already registered, please make sure that you get counted as well. Tag your friends and ask them to tag their friends to sign up. In addition, as part of the “Pay it Forward” part of this four-month long promotion, the month of April will be designated as “True Leaders in Service” Month with a focus on community service. More information will follow regarding this particular component, but be thinking of ways that your local 4-H program could participate. Information and tools to promote this effort can be found on the 4-H Marketing Online Resources Center (MORC) found at: http://4-h.org/professionals/marketing-resources/ This site is secured and only available to 4-H professionals, so if you have not already been to this site and signed up for access, please do so. You are really missing out on great resources by not doing so. 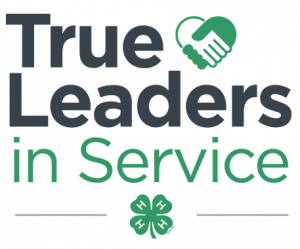 4-H is also launching the annual True Leaders in Service initiative in honor of National Volunteer Appreciation Month. True Leaders in Service, a month-long community service activation, will officially kick-off the first day of April, and culminate with the National 4-H Day of Service on Saturday, April 29. The website is live and has many resources along with a tool for registration your service activities. Please begin planning for service projects that your 4-H’ers can do in your community during the month of April. To register your event and to access the event planning guide, go to the link below. New bluegrass music festival, Boo-Grass By The Lake, was held at the Airfield 4-H Conference Center on October 28 and 29, 2016.. In the magazine Bluegrass Unlimited, Ted Drake writes about the festival, Airfield, and 4-H. The festival used the new event to raise money for 4-H and to introduce new people to the 4-H mission, vision, and the Airfield Center. The festival included more than just great music. There were also equestrian events, a mounted shooting event, a reenactment Calvary group, and clogging courtesy of The Kountry Kickers. Overall, it was a great first time event! The 2nd Annual Boo-Grass By The Lake is set for October 27 and 28, 2017. The old adage “it takes a village” is right on target when it comes to delivering a quality, safe, and fun camp week. Successful camp programs happen when the 4-H Center staff, Agents, and volunteers work as a team – independently and as a group. Giraffes: center places their hands directly over their head and together forming the neck, while the outside two arch their backs touching the middle person’s toes to form the legs. Dr. Amy Johnson grew up in Highland County, VA on a beef cattle and sheep farm. She has been in 4-H since she was seven (29 years!). Her projects included Livestock, Public Speaking, Presentations, Share the Fun, Livestock Judging, and 4-H Camp. Later, she served on State 4-H Cabinet 2 years as District Ambassador and State Secretary. She also attended National 4-H Congress, National 4-H Conference, Canadian National 4-H Conference as a US Delegate, competed on the State 4-H Livestock Judging Team and was 7th Individual Overall at the National Contest in 1997. In high school, was also active in FFA – served as multiple chapter officer positions. Her degrees include Bachelor of Science in Animal Science (Virginia Tech), Associate Degree in Emergency Health Services and Associate Degree of Nursing (Jefferson College of Health Sciences), and Bachelor of Nursing and Doctorate in Nursing Practice (Radford University). Amy has also complete graduate research in farm safety and prevention of agricultural injuries and regularly speaks to agricultural and public interest groups about rural health, agricultural safety, and preventative medicine on the farm. Amy currently lives in Bedford with WP on his family farm, grow wheat, soybeans and hay. She has two kids (Katie, 4 and Tater, 2), works as a Family Nurse Practitioner at Centra Medical Group, and volunteers as adult 4-H leader with Bedford County. She also sits on the Board of Directors for Moneta Rescue Squad as Medical Advisor, is President Elect for Lynchburg Region of Virginia Council of Nurse Practitioners, is the Chairman of Bedford County Farm Bureau Young Farmers Committee, and is a member of the Board of Directors for Bedford County Farm Bureau. She is also serves as Clinical Advisor at Old Dominion University, where she serves as preceptor for nurse practitioner students from multiple colleges and universities. 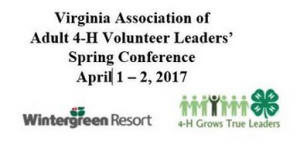 The VAA4-HVL Central District is hosting the 2017 Spring Conference at Wintergreen Resort. During this conference volunteers will participate in educational workshops and tours while networking with other Virginia 4-H volunteers and faculty and staff. Conference Registration form must be postmarked by March 10, 2017 to avoid the $15 late fee. VAA4-HVL board members and advisors met in Amherst in late January to begin plans to implement the 2016- 2020 strategic plan. Over the course of 2016 the executive board developed a strategic plan with the following vision and mission statements. To support and retain Virginia adult 4-H volunteer leaders to strengthen the Virginia 4-H youth development program. 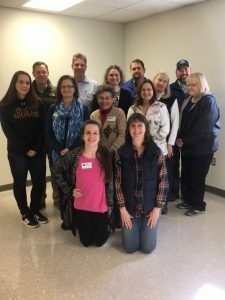 To educate and train 4-H adult volunteer leaders so that they can promote and provide support for the Virginia 4-H programs. To accomplish the mission and vision of the association, three goal areas (promotion, resources, and financial resource development) with defined objectives and strategies were identified. The VAA4-HVL plans to conduct a survey of volunteers to learn more about what training topics are most needed. 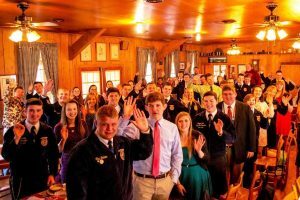 Each spring, the Virginia Cooperative Council sponsors a three-day conference, which will be held this year from March 31 – April 2, 2017 at Graves Mountain Lodge-Syria, Virginia for Virginia 4-H and FFA students. The primary objective of this Cooperative Education Conference is to educate youth about the unique aspects of a cooperative business. 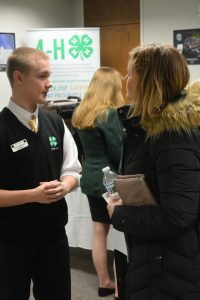 4-H/FFA participants will gain an understanding of how cooperatives differ from other business and will hear about cooperative success stories in both the agricultural and non-agricultural sectors. In a team setting, attendees will serve as managers of a simulated cooperative store, competing with other stores in their market area for sales and profit. Teams will also analyze case studies, develop their own student-run cooperative, and participate in team-building and leadership development activities. The overall top scoring 4-H/FFA members will win a college scholarship, ($2,000, $1500, $1000) that can be used to attend a college of your choice. Several students will also be selected to attend the NICE – National Institute on Cooperative Education conference at the University of Kentucky in late June. Through an interactive, educational, and entertaining conference, students will enhance their business, teamwork, leadership, and communication skills. Each member, age 16 – 19 (as of July of year attending) selected to attend the Virginia Conference will receive a scholarship to attend the state conference. Members must be willing to attend the entire weekend. (Friday, 10:30 a.m. – Sunday, 2:30 p.m.) and abide by a Code of Conduct. About 500 4-H youth, volunteers, parents and 4-H staff from across the state put civic engagement in action at 4-H Day at the Capitol on Tuesday, January 24, 2017. 4-H groups interacted with their legislators sharing their 4-H stories and 4-H impacts. They observed legislative committees working, listened to current issues the legislators discusses in session, and developed a better understanding of our state government. 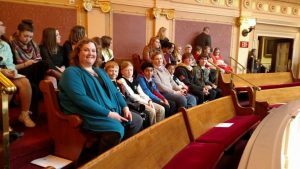 4-H groups toured the Capitol, the Supreme Court, or other areas of historical interest. 4-H groups gathered on the Capitol steps for the 4-H Rally and a group photo. Kailey Blaylock, President of the Virginia 4-H Cabinet welcomed everyone to 4-H Day at the Capitol and Jasmine Johnson and Madeline Harris, Central District Ambassadors, held the flags for the pledges. Dr. Ed Jones, Director, Virginia Cooperative Extension, welcomed everyone and spoke about Virginia 4-H impacts. First Lady Dorothy McAuliffe spoke about the importance of 4-H youth development and civic engagement. Secretary of Agriculture, Basil Gooden, Secretary of Commerce, Todd Haymore, President Makola M. Abdullah, Virginia State University, Dr. Ed Jones and Dr. Cathy Sutphin, Associate Director Virginia 4-H participated in the 4-H Rally interacting with the various 4-H groups. 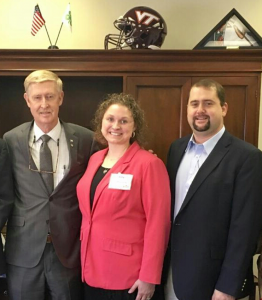 The Virginia 4-H Foundation hosted a Legislative Open House on Monday, January 23, 2017. 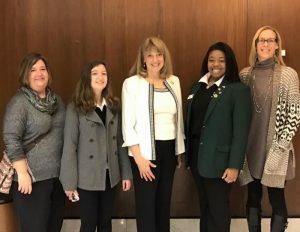 Legislators interacted with the 4-H Cabinet and 4-H Foundation Board members learning more about the impacts of Virginia 4-H and the importance of 4-H positive youth development to the Commonwealth of Virginia. About 500 4-H youth, volunteers, parents and 4-H staff from across the state put civic engagement in action at 4-H Day at the Capitol on Tuesday, January 24, 2017. 4-H groups interacted with their legislators sharing their 4-H stories and 4-H impacts. 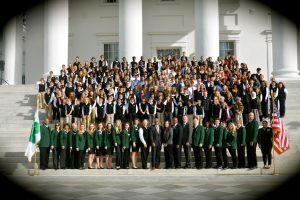 Delegate Robinson shared her experience meeting 4-Hers in her newsletter. Thank you Delegate Robinson for helping 4-Hers learn about civic engagement! 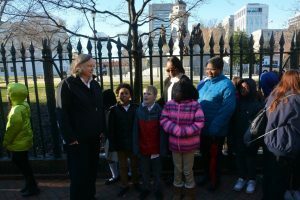 The Inaugural Citizenship Washington Focus: Presidential Inauguration was a huge success. As a political enthusiast myself, participating in the peaceful transition of power was very empowering. Taking the knowledge of what was happening on Capitol Hill and actively applying it to our group discussion was the main focus of the conference. I had the opportunity to meet people from across the nation and learn about how their location, demographics, and project areas influenced their political ideology. Advancing my networking skills as well as enhancing my discussion abilities was definitely one of the major highlights of this experience. As a result of the conference, my appreciation for diversity and discussion has only grown. Entering a discussion with the full understanding that everyone brings something different to the table was understood and communicated from the beginning. With that understanding, delegates quickly jumped in head first into deep democratic conversations. Virginia was well represented with six excellent delegates. We made lifelong friendships and built life skills that will shape our future. Thank you to everyone who supported our journey to witness first hand the peaceful transition of power!